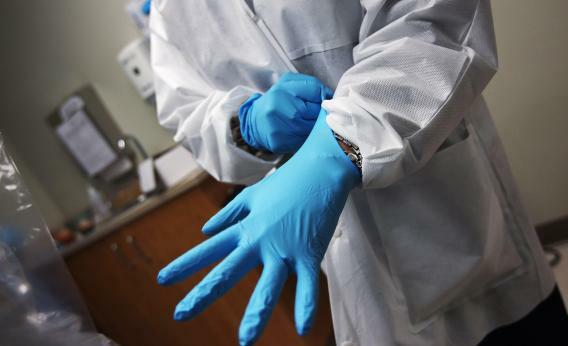 A dentist dons sterile gloves at a community health center on March 27, 2012 in Aurora, Colo.
One of the tragedies of the Affordable Care Act debate is that for all the pixels spilled over it, there are still dozens and dozens of provisions that have barely been discussed. I, for example, am more interested than your average person in the issue of how dentists extract regulatory rents from patients and dental hygenists through rules that make it illegal for hygenists to offer teeth-cleaning services to people unless they’re employed by a dentist. And yet until Jon Chait reminded me yesterday, I’d completely forgotten that one element of the Affordable Care Act tackles this issue, prompting furious backlash from the dental lobby. It’s also noteworthy how growing dysfunction in congressional procedure makes this kind of sensible reform less and less likely. One problem with reforming dental regulation to help patients is that the dentists are a concentrated interest that’s more able to lobby effectively than are the disparate interests of patients. But there’s more to life than lobbying clout, and probably some coalition of counterveiling interests—hygenists themselves, vendors of teeth-cleaning equipment—can be found on the other side. A more profound problem is time. Few senators came to Washington primarily to focus on dental reform. But if a handful of senators is strongly opposed to reform, they have the ability to ensure that any proposed reform chews up many, many days of floor time. That’s time that could be consumed on high-priority national issues, on picayune things that are locally important to specific members, and on leadership concerns like nominations. Consequently what began as a small coalition against reform quickly morphs into broad-based opposition to the idea of wasting Congress’ time on a relatively minor issue. So the only way anything can get done is by folding it into a mega-bill like the Affordable Care Act. But both members of Congress and members of the public are basing their views on the ACA on hazy overall considerations of ideology and partisanship, not detailed examination of its particular provisions. Consequently a small, sensible, nonideological reform stands a good chance of dying at the hands of the Supreme Court or some broad 2013 repeal legislation without anyone explaining why.